The 1962 Topps / Bubbles Inc Mars Attacks Trading Card Set consists of 55 cards and was actually produced by Topps, but marketed under the name "Bubbles, Inc". 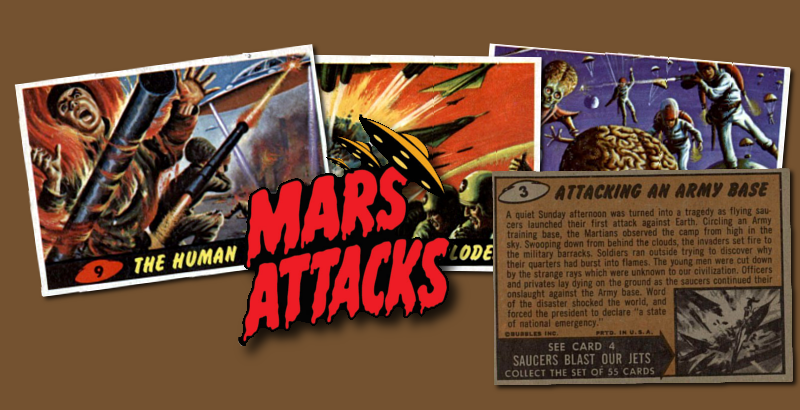 The first Mars Attacks card, "The Invasion Begins", as well as the last card, the checklist card, are the two most valuable cards in the set. The 1962 Mars Attacks Trading Cards were distributed in vending machines and became extremely popular with the kids. The 1962 Mars Attacks cards sparked controversy with parents and kids because of their gory images and themes, so Topps stopped producing the set. This action only increased the popularity of 1962 Mars Attacks Set and it remains popular to this day. CLICK HERE if you want to sell your 1962 Topps / Bubbles Inc Mars Attacks cards. Showing 1 to 55 of 55 products.